Michael Brown is a native of Charleston, SC and was educated in Charleston County School District. As a child, Michael was rooted in Christian values and nurtured to have an immense love for music. His father, Pastor Bernard Brown, sang in quarter groups and his mother is a well-known church musician and singer, playing for churches all over the Charleston area. He and his brother and sister were often given music lessons on long car rides as they were taught how to harmonize and develop their musical ear. “Music was the first thing I knew I loved from every angel” says Michael. Music was everywhere in young Michael’s experience. He soon learned to play his first instrument, the drums, and went on to begin his first official job as a musician at the tender age of 11. 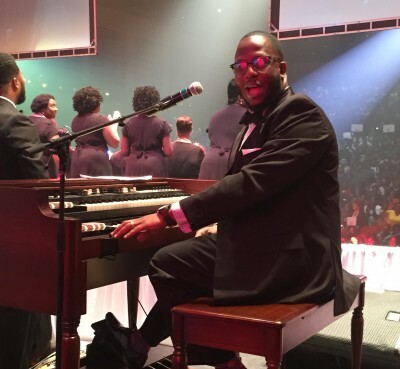 He was trained by a phenomenal local musician named Micah Fields and is the protégé of one of Gospels premier organist, Mr. Joey Jones, the music director for the late Rev. James Cleveland. Over time, Michael has developed an impressive musical background and list accomplishments that include musical director, songwriter for Grammy award winning artist, arranger, vocalist and more. He’s been privileged to share the stage and his musical talents with Tye Tribbett, Tasha Cobbs, the R&B Diva “Lil Mo’ and soul sensation Anthony Hamilton to name a few. Two of his greatest passions are Music and people. He’s been blessed to use his gift to marry his passion for both. He’s been honored by numerous organizations for his contribution to his city’s youth by using music as tool of inspiration. He travels on mission assignments teaching music to kids in countries like Haiti and The Dominican Republic. Michael has toured the U.S., Spain, England, Croatia, Various parts of Europe and the world sharing his gift. The evolution of music will never cease in his life!